Reflecting on Psychology (RoP) means putting psychology in perspective. Our goal is to understand why psychological concepts and phenomena are the way they are, and how they could be different. Using perspectives from the history, philosophy, and sociology of science, this master encourages students to study the field of Psychology itself, and to explore its relations with other parts of science and society. Students of Reflecting on Psychology will study topics such as the value of fMRI scans for law, the distinction between enhancement and therapy, the influence of media stories about autism on its clinical reality, the dominance of the experimental method in psychology, or the cultural variability of psychological phenomena. This programme aims to attract a select group of students who will be supervised individually and encouraged to come up with their own research topics. Students from Reflecting on Psychology will become skilled in writing, qualitative analysis and reflection. They will learn how to write essays, participate in discussions, and give lectures. By examining psychology's past and its present, as well as its issues and its boundaries, we aim to give students access to its future. unique in Europe, we know of three English-speaking graduate programs in the world. Our one year programme consists of 30 EC courses, and a 30 EC master thesis project – which can include an internship of maximum 15 EC. Our foundation courses are Conceptual Issues in Psychology, which is a course in classic and theoretical readings we find essential for this master, and Brain, Consciousness and Society, which deals with findings from psychological, psychiatric and neurological research and their reception. Our elective courses are Capita Selecta Reflections of Psychology, for which you will prepare a lecture on a topic that deals with reflections on psychology or adjacent fields; and Boundaries of Psychology, which explores the boundaries of psychology as a scientific discipline. For most courses you have to make assignments or write essays. Since writing is such an important aspect of our programme, we also offer a course in Writing Skills. This course runs through the first three blocks, and will help you in your writing process. Furthermore, we offer a course in Qualitative Research Methods, in which various ways of doing qualitative research will be explored. All courses are given in the first three blocks, the last block is free of courses to give you the opportunity to finish your master thesis. A BSc in Psychology. For exceptions and a full description of admission requirements, please consult https://www.rug.nl/gmw/psychology/education/master/aanmelding-en-toelating/ NB: Only students with an HBO (Dutch University of Applied Sciences) Applied Psychology degree can be admitted to the (pre-)master's programme. Applications of students from other HBO programmes will not be considered. The application procedure depends on prior education. For a full description of the application procedure, please consult the page on Application of the Psychology master. Reflecting on Psychology is the master programme of the expertise group Theory and History of Psychology. We study the relations between Psychology (and related disciplines), the subjects they study, and the society and culture that they are part of. We draw our inspiration from History and Philosophy of Science and from Science and Technology Studies. Maarten Derksen has written about the relation between psychology and common sense, about the history of clinical psychology, and about evolutionary psychology. In general he is interested in differences and boundaries in and around psychology. His current research concerns the history of the engineering ideal in psychology and social science: the dream of effective and efficient control over human behaviour. Jeremy Trevelyan Burman's main interest is in the popularization of Piaget, and thus how ideas about development have been understood (and also what has been missed). But he is interested more generally in the movement of scientific meaning: over time, across disciplines, between languages, and internationally. Burman’s most popular piece, in this connection, is a historical critique of the popularization of “memes” that was published by Perspectives on Science in 2012. More recently, he has also been pushing for the advancement of methods drawn from the Digital Humanities as a way to formalize discussions of meaning change in the History of Psychology. My name is Stephen Scholte. I am currently a Doctoral Researcher in the Science Policy Research Unit at the University of Sussex. I am working on a project which investigates serendipity in science and technology research and development, with a specific focus on psychopharmacology. I was alerted to the opportunity here in Sussex via an email from Maarten Derksen, Assistant Professor of Reflecting on Psychology at the UG. He forwarded to me the call for applications for this ERC-funded position. The application involved sending a writing sample, a CV and a motivation letter as well as writing a research proposal. I was offered an interview, so I came to meet the potential supervisors and check out the city. They offered me the position and now here I am! The abilities I honed and knowledge base that I developed during my stay in Groningen were, I am told, influential factors in being offered the position. Being able to critically reflect on the methodologies of social sciences, a knack for drawing different strands of empirical and theoretical work together into novel constellations, and a competence for writing clearly and engagingly are all skills for which I owe much to the Master’s programme in Reflecting on Psychology. Next to introducing me to some of the most interesting work in the theory, methodology and history of psychology and the social sciences, the Master’s programme in Reflecting on Psychology at the UG may have been most useful in providing the framework within which I learnt to really think. Knowledge in isolation means little and the contemporary context, which allows near immediate access to any piece of knowledge in the cannon, only accentuates the futility of becoming a walking encyclopaedia – we have one constantly in our pockets. What is necessary, and of utmost value in almost any interesting occupation (and especially for aspiring academics such as myself) is the ability to analyse, to reflect and to connect the oversupply of information with which we are constantly confronted. This, I learnt in Groningen, and it is what I try to do every day in my current position. The process of writing a Master’s thesis taught me things that I did not realize would be so valuable; in large part, the autonomy and discipline needed to conduct actual research. It taught me to take responsibility for my own direction and for my own thoughts. I don’t believe there is anywhere else I would have been given the freedom and support that I received during this Master’s programme. These allowed me to really work on myself as a researcher and writer. The path to find one’s own voice is foggy and likely interminable, but I was definitely gifted a powerful torch by mentors and supervisors during the Master’s programme. My academic voice] is one articulated in a vocabulary comprised largely of the content of the course units which make up the Master’s programme. I have an interesting job that I enjoy, and I have my studies in Groningen largely to thank for this. On an everyday basis, I am putting into practice the skills that I developed throughout my studies; critical reading and analysis, drawing cross-disciplinary connections, and applying, comparing and adapting theoretical frameworks to empirical data. There are a host of skills also which are far more difficult to articulate, somehow tacit skills, that are only gained in proximity to experts and through practice under the guidance of experts. Something like critical intuition is a big part of this for me and helps me immensely in the constant decisions that one must make as a researcher: what ideas do I follow? Which lines of investigation could be interesting? Where do I narrow my focus or zoom out? In my late twenties, with a degree in Music and a job in a terrible bar, I decided to go back to university and study Psychology. I ended up doing the Bachelor’s programme in Groningen – more by circumstantial accident than divination. During the programme, I found that the kinds of questions I was asking my professors usually resulted in recommendations to go and speak with someone in the Theory and History department − which I did. I initially arrived in the office of Trudy Dehue, hoping for some answers. But I was not given any – just a host of new and improved questions. I was hooked. Over the course of the Bachelor’s programme, I followed every course unit I could that was being taught by the staff of this department, and was continually gifted with the time, openness and support of the Theory and History staff. There was little doubt for me after graduating with my Bachelor’s degree that this was the place for me to continue with the Master’s programme. My only reservation was that I wanted to follow the Master’s degree with a PhD project, and I had regularly been told that this was almost impossible without doing a two-year Research Master’s – but here I am! I have probably extolled the virtues of the programme and the staff members enough already, but it was also the social environment and city of Groningen that made my time there so enjoyable. I found a group of people with whom I was comfortable yet regularly challenged, who had shared interests yet diverse backgrounds and perspectives, and even as a somewhat older, less “studenty” student, I very much enjoyed inhabiting the welcoming little city of Groningen. The next three and a half years will be occupied by my PhD research. In this, I hope to be able to say something insightful and useful about the way in which targeted research programmes interact with the praxis of psychopharmacological treatment. Beyond this, I will have to wait and see; at this stage I would like to continue in academia, which likely means finding a postdoctoral position somewhere, and hopefully one day I will be lucky enough to end up in a faculty like the one in Groningen. I’m wary to give advice, as I realize that what works for one person may not necessarily translate to success for the next, but for myself, the opportunities that I have been most grateful for have generally come from following the things that I really love to do. NO RAGRETS! (typo intentional). I come from Greece, but my mother is Dutch and I have fond memories of visiting the Netherlands in the summer. That's why I decided to study in the Netherlands. 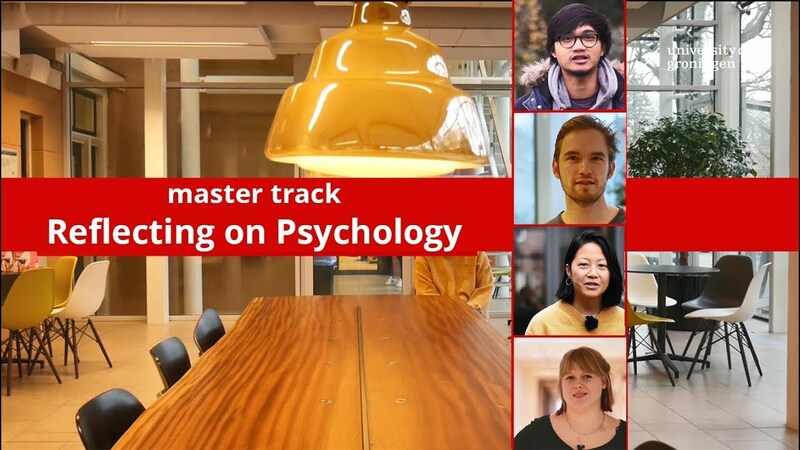 When I started the programme, back in 2009, the University of Groningen was the only Dutch university to offer English-taught Psychology programmes, so Groningen it was. Groningen is a beautiful city! I like that it's small: you can walk almost everywhere and it has an intimate feel to it. And as there are so many students it almost feels like you're living in one big university. All in all it's a very pleasant place to live and study. The Master's programme in Reflecting on Psychology is interesting because it's so broad and varied, and addresses many of the aspects of the science of psychology that I really like to get stuck into, both historical and theoretical. You are also given the freedom to focus on those aspects that interest you. It's a great programme in terms of learning to think critically, and it really improves your writing skills. There are only four people in our class, but we have a great connection. We enjoy each other's company and get along really well with each other. Plus we get the personal attention we need from our lecturers. I hope to find a PhD position after I'm done with my Master's. I would like to look at psychology and psychotherapy from the public's point of view: how do people perceive therapists and counselling, how do they form opinions about them and how have these opinions changed in recent years? I'm not sure where I'll be able to do my research, but I would love to do it here at the University of Groningen! Manager of the Applied Psychology programme of the Hanze University of Applied Sciences in Groningen. I started studying Psychology at the beginning of the 90's in Groningen. Initially, I wanted to specialize in Clinical Psychology, and I almost finished that programme. However, I wasn't very satisfied with the courses, and I kept running into the same problems. I had a lot of questions concerning the field of Clinical Psychology, and I didn't receive satisfying answers to them. At a certain point, I took a course at the Department of Theory and History of Psychology (now part of the Master's programme 'Reflecting on Psychology') and I found that so interesting that I decided to complete that programme instead of Clinical Psychology. At that department my critical attitude was very welcome. I learned, for example, how research is conducted and why in that way, or where knowledge comes from. After finishing my studies, I worked as a researcher and teacher for a while in Maastricht, until I fell in love with a boy from Groningen and moved back to the north. I started a job there as a student counsellor at the university. A student counsellor helps students with problems, for example, with a handicap. I talked with such students; and I was also involved in policymaking: how can we make sure that handicapped students are able to study successfully. I, together with others, made sure that things are much better organized for this type of students, by now. The things I learned during my studies were very useful for my job. It influenced the way I looked at students diagnosed with, for example, adhd or autism. I could see that those diagnoses were just a little piece of their reality into which I could introduce another piece of reality, so they could study successfully. It's a way of thinking I learned during the Master's programme. In my current job I am the coordinator of the first year of the GP training programme of the RUG (Huisartsenopleiding). In April, I will start working as manager of the Applied Psychology programme of the Hanze University of Applied Sciences in Groningen. It will be a new challenge, and I'm really looking forward to it. I have never regretted my choice to switch to Theory and History of Psychology. It was great to attend classes taught by people like Trudy Dehue and Douwe Draaisma, they are such inspiring teachers, and they really taught me how to write. In The Netherlands there are almost no theoreticians in or historians of psychology, which is exactly what we focus on in this Master's degree. My name is Boudewijn Wieringa and I'm 32 years old. 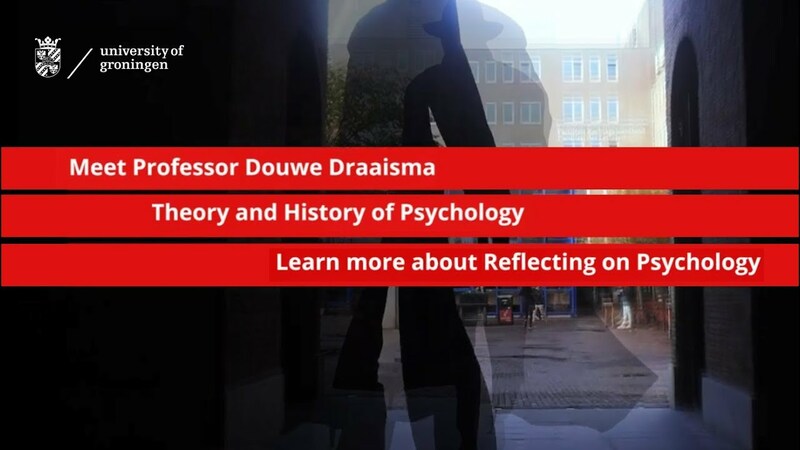 I started the Master's degree programme in Reflecting on Psychology this year, after I finished the Dutch Bachelor's degree programme in Psychology. During the Bachelor's phase I had a lot of questions which remained unanswered during lectures. That's why I decided to pick this Master's. Here we look at psychology in a different way, a more critical way. Other Master's programmes might teach you what a person should have in order to diagnose him or her with ADHD. In this Master's you ask the question, what exactly is ADHD, and why are there so many more children with ADHD now than 50 years ago? Can it be because parents are more stressed, or because they put more pressure on their children? The study material for this Master's is more abstract than that of other Master's programmes. We wonder why things are the way they are in psychology and ask critical questions. In The Netherlands there are almost no theoreticians in or historians of psychology, which is exactly what we focus on in this Master's degree. I find it more interesting than anything I did before and I haven't been bored during this Master's at all. A big difference with the Bachelor's in psychology is the size of my class. This year there are only four students in total, and we have five lecturers. This makes it very easy to ask questions during class and you get to know the lecturers and your fellow students very quickly. We don't have many classes, so you have to read and study a lot by yourself. When I finish this Master's I'd like to stay at the University to do research or maybe also teach, I'm not sure yet. I started the Bachelor's programme in Psychology in 1995 with the idea of doing clinical psychology. That was until I took course units in Theory and History of Psychology. I was hooked. They made me think and reflect a lot more on the discipline rather than just learning things by rote. I found it fascinating to look critically at how we research things in the discipline and to discover that it has not always been this way. I ended up specializing in Theory and History of Psychology, which is comparable to today's Master's programme Reflecting on Psychology. After I graduated I wasn't sure if I wanted to go into academia. I thought it would be really boring and that you would spend the whole time chained to your desk, never seeing the world outside. So I decided to go into journalism, because that seemed more exciting. I really enjoyed journalism, but at a certain point I found that I missed the research and the opportunity to spend a longer period getting right to the bottom of a topic. I decided to return to Groningen to do a PhD at the Department of Theory and History of Psychology. The image that I had of research proved completely wrong. I had a huge amount of freedom and could decide for myself how I spent my time. There is no one saying that you need to be at your desk at nine in the morning. You can do your work anywhere. You do need a huge amount of self-discipline, so it is not for everyone, but I love it. You also get to travel, for instance for archive research abroad or conferences. It is also much more creative than I had expected. I am really glad that I decided to do it. After my PhD I did a postdoc in Amsterdam, and then I found my current job at Leiden University. I lead a research group that is investigating the effect on academic research of the growing evaluation culture. The number of articles that academics write, how often they are quoted or how often an article is read is increasingly being monitored. These metrics play a growing role in what is considered good and who is appointed to university posts, for instance. The hypothesis of our research is that if you keep on using quantitative metrics to exert pressure on researchers, they will start basing their decisions on these metrics. They will not opt for complicated research that fewer people read but instead for the sexiest research that reaches more people. The question then is if we will still conduct the most important research, because our main concern will be how much we are being read and if we are being published in the right journals. A lot of what I learnt in Groningen is still relevant to my current work. The manner of thinking and writing that I learnt then has become second nature to me. You learn to take a sharp and critical look at developments in society. Although the topic that I am studying has changed, the training in Groningen forms the foundation of my current work. Here you learn to think about psychology. I was looking around on the faculty website when I found the Reflecting on Psychology master program. The things I read appealed to me a lot: it's a broadening program, which is pretty unique at this faculty. And it touches on all kinds of other fields, like sociology, philosophy and anthropology, which I also find very interesting. Actually, I wasn't sure at the time whether I already wanted to start a master. I was considering maybe taking a gap year. But Reflecting on Psychology really got inside my head. So in the end, I followed my gut feeling and went for this master! I don't have any concrete plans for the future just yet. Since Reflecting on Psychology is such a broad program, it doesn't really guide you toward a specific profession. I have all my options still open, nothing's fixed. The same applies to the course program itself, by the way. This is the first year the course is offered. That means the program is very flexible and free, there's a lot that we can design just the way we want it. And because there are only four students, the lecturers have all the time in the world for personal attention and guidance, which is great. One skill you absolutely improve in this program is writing. I enjoy that very much and missed it a little during the bachelor. Plus, we learn to think about psychology: what does the field do, how does it manifest itself through the years and within society? It's what I like to call a helicopter study, where you look at the field from above. My name is Jeremy Trevelyan Burman. I'm a Canadian research psychologist. My primary field, the history of psychology, is a bit different from most other areas: it's a kind of critical meta-psychology. This is always interesting: I'm constantly surprised by what we didn't know, but thought we understood. Our program, Reflecting on Psychology, is pretty unique. This is because it’s offered by a group here at the RUG that is composed of experts in the Theory and History of Psychology. As a result, this is the only school on this side of the world where you can get trained up to the highest levels in the area: you can start in the Bachelor, continue on to the Master, and then finish as a PhD. We ask our students to think, to write, and to share their ideas. What makes our program different from others, though, is that we have specific tools to help elevate the quality and rigour of our students’ thinking. We don’t teach specific skills that a student might need for a particular job after they graduate. But we certainly can teach you to be better at jobs that require careful, critical, and high-level thinking, writing, and communication. That, I think, is very valuable. VIP is the study association for the Psychology students at the University of Groningen. VIP organizes study-related and social activities. As a VIP-member, you receive a discount on study books as well as a discount on VIP activities. On this website, you can find more information about VIP, our events, committees, and the book sale. Interested? Not sure? Courses such as Theory of Science, Philosophy of Psychology, or Controversies of Psychology are good introductions to this master. Our academic advisors provide more detailed information about our programmes and give advice to prospective students, students who are enrolled in one of our programmes, and alumni.You can turn to them with questions about the programme itself, study planning, choosing courses/minors, enrollment, rules and regulations that apply to a programme, following courses at other faculties, studying abroad. Do not hesitate to make an appointment with your academic advisor. You can arrange for a meeting by phone (+31 50 363 6301, student service desk) Please also check our online information system: www.rug.nl/gmw/questionandanswer. Often, you are not the first person to have a particular question, and the online information system may already have an answer for you.